People and cats just go together. Even if cats are for the most part stand-offish, most people simply find it hard to resist feline charm. As for cats, domesticated ones look up to humans for their survival and although it’s not always exactly a balanced state of affairs, there is some amount of reciprocal love involved. The allure that cats casually but so strongly exert on humans has touched on almost every aspect of human life. From commerce and industry (cat food, cat bassinets, cat costumes, cat this and that) to technology (lolcats) and even fashion (cat suits and cat make-up), cats have managed to exert a dominant influence in our society. And now, there has been a resurgence of more cat-inspired fashion – cat-eye design eyeglasses. Hollywood stars that were famous in the 1950s to the 1960s, such as Marilyn Monroe and Audrey Hepburn, popularized cat-eye eyeglasses during their time. Fascinating and breathtakingly gorgeous, these stars could set trends just by stepping out in a new outfit or by wearing new accessories. That pattern exists up to this day, with celebrities such as Katy Perry exuding a cool kind of charm as she sports the most fashionable in cat-eye design eyeglasses. It’s really an enjoyable feline blast from the past, a retro look that doesn’t cause eyebrows to rise, and corners of the lips to crinkle in secret amusement. As far as retro fashion goes, cat-eye design eyeglasses epitomize an iconic kind of cool stylishness. The eyes of cats are so intriguing because they have a certain kind of lift at the corners. It’s as if they’re being naughty and demure at the same time. 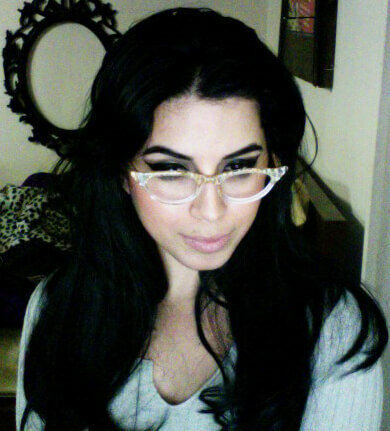 Women who enjoy having a subtle air of mystery will do well with cat-eye glasses. Curiously, the same glasses can make a woman project a bold and assertive attitude, the type who works efficiently to turn negotiations in her favor. With shapes that encompass ovals to corner-rounded rectangles, and rectangles with a slight lift at the corners, the glasses are flattering to wear at any time. Rimmed or semi-rimless, with a wide choice of chic translucent, solid, or patterned designs and colors, cat-eye glasses are available in various types, for different kinds of situations. There are cat-eye reading glasses, cat-eye sunglasses, and the simply fashionable-to-wear cat-eye design glasses that are worn for nothing more than to complement the wearer’s natural beauty. Take your pick and purr your way to stylish contentment.